The Hofner Bass was popularized by Paul McCartney, who still plays the original one he bought when performing in Hamburg with the Beatles. It has proven to be a worthy instrument for bass players worldwide who appreciate its distinct sound. Like all stringed instruments, it requires periodic adjustment to play in tune and sound its best. Measure the distance from the fingerboard side of the nut to the middle of the twelfth fret. Measure the distance from the middle of the twelfth fret to the middle of the bridge saddle insert under the G string. These distances should be the same; if not, loosen the strings and gently slide the bridge to the correct distance. Plug in the electronic tuner and pluck each string with the pick while slowly tuning them to standard pitch. 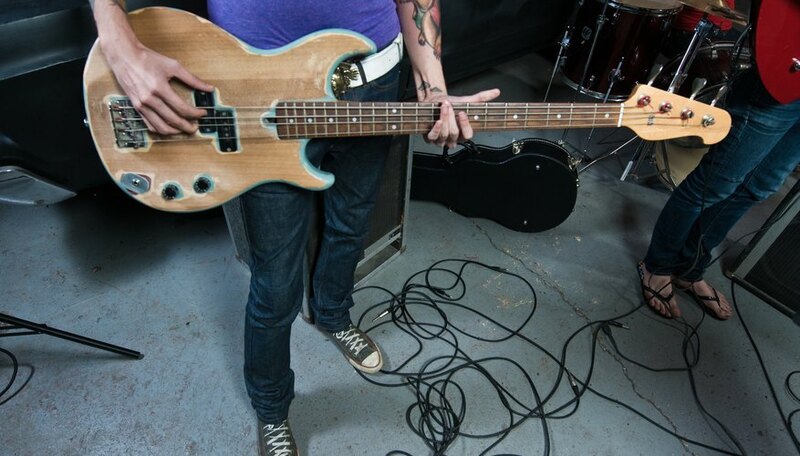 Leave the bass plugged into the tuner. Adjust the string height as desired for comfortable playing by turning the knurled thumbwheels on each side of the bridge carefully with the needle-nose pliers. The height should be set so the strings won’t buzz or rattle when playing in low or high positions on the fretboard. Lightly touch the G string at the twelfth fret and pluck with the pick to sound the harmonic tone while watching the tuner. It should indicate correct pitch; if not, continue sounding the harmonic tone while tuning the string until it’s tuned to the correct pitch. Fret the G string firmly at the twelfth fret; if the fretted note shows sharp (higher) on the tuner, loosen the strings and slide the bridge back about 1/8 inch, retune the strings and repeat the above procedure until the fretted note is at the correct pitch. If the fretted note shows flat (lower) on the tuner, loosen the strings and slide the bridge towards the neck about 1/8 inch, retune the strings and repeat the above procedure until the fretted note is at the correct pitch. Repeat the above procedure on the E string to set the other side of the bridge for proper intonation. If carefully done, this procedure should have all the strings intonating correctly. If the instrument won’t play in tune or the strings buzz on the frets after adjusting the intonation, the neck may be warped and require resetting. This job is best left to an experienced luthier, who can remove it without damaging the instrument and straighten it as necessary. Avoid exposing your instrument to excessive heat or cold; this can cause the neck to bow or the wood to crack and require professional repair. Since 1985, Jack Brooks has written about construction, electronics, business, the Internet and online marketing, among other topics. His work has appeared in "Inland Empire" newspapers, feature supplements, website content and online articles. He attended Northern Virginia Community College for two years, then worked as a professional musician/songwriter for 30 years.